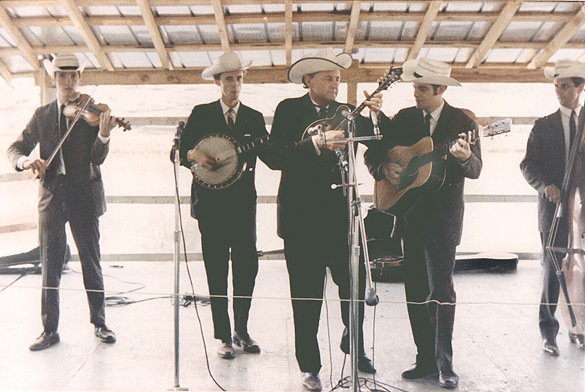 Bill Monroe and the Bluegrass Boys 1966.
a minute that Bluegrass itself was at one point in the 1940's Avant Guard. technical capability. Lamar Grier was part of that band, he played the banjo. of Monroe on the bus teaching Richard Greene how to play instrumentals to be used in the shows. The following interview is the product of an exchange of emails that continues at the time of this posting. humor in that. I also played & recorded some with Frank here in the D.C. area when he was active with Red Allen era. the 1965 first Bluegrass Festival in Roanoke (Fincastle) VA. which you have the "program" listed on your web site. Jim Moss: Yes, Frank has a very similar Loyd Loar to Bill's, but it was probably red or something.. The tape that I have is with Richard Greene on the fiddle and you were playing banjo. with Richard had me on the banjo. Jim Moss: I have some live shows from the opry too. Richard said he thought your wife had recorded them. the air on the Opry. Before I left my house for the Opry, we knew the time segments that we'd be on. As time went along, I felt that Bill definitely was a fiddle person. Not a banjo person at all. Another interesting tidbit; his instrumentals were mostly fiddle tunes, and a few mandolin tunes. pretty slides. But I ended up not liking it too much because it was very slow & difficult to play. Jim Moss: Are you playing much these days? doesn't build the fire under me that it once did like the Monroe, Flatt & Scruggs, Chubby Wise combo. Earl's playing live shows all day long mainly because every time he took a break in a song, it was different. Usually right hand subtle tricks. Earl told me once that he felt that he was a "right-hand man" and I agree. Later reflecting on his statement I felt that Don Reno was an example of a "left hand man". and we know the style and what crosses the line, so we just go for it each time. How about doing an interview with me for the web site? have come from it. I enjoyed being a side man - most enjoyment came from playing back-up. which I recognize isn't the general thinking of most others. I'm more content with being in the background. Jim Moss: You did this octave thing on Rawhide... that was very cool. pattern I did almost every time we did that song. Ya know, that song was played on about every show we did. Jim Moss: I think that break is hot. one example, Buzz Busby as another) for about 10 or more years when I went with Monroe. focused mainly on banjo players and not fiddlers, mandolin players, or other side men's activities. I felt that I had my hands full just doing my own job - that being a supporting banjo player for the group. all of his music, every song, could be handled by a fiddle but not a banjo. He of course was right. but it was Bill picking & choosing his comparisons. pictured Bill as a small meek little man that sang high & just happened to play the mandolin. previous Bluegrass boys had attempted to fix or improve the bus & its condition. Look at that end result! There was no maintenance done on that bus until it was required it to keep motivating. Jim Moss: I had frozen a few times myself driving out there in the desert at night. in newspapers and the sleeping bag I always had on my bunk. Oh - - - they were the (alleged) good times. she wanted $5.00 to buy a used clothes iron from Goodwill. That argument with her went on for at least 15 minutes. Jim Moss: I have one thing to say to you, Hair Drier! We had a motel like that in Portland OR once. It was freezing in the rooms and the idiot desk clerk came out to the room and just said, "its on", then looked at me. I found that my 1800 watt hair drier worked just great to bring the room temperature from 45 f to 80 f in about an hour. Monroe's band wasn't making much money at that time, right? Did you get to play very often? Lamar Grier: When I first was with Bill, we made on each show date $25. That was the musicians union rate. a part time job at a convenience store working overnight for minimum pay at the time, just to acquire family needs. Needless to say, things markedly improved financially when I left & went back home to Maryland. Jimmy Monroe & thought of him as an acquaintance, and not a friend...like the other band members. as acquaintances? Or that you all thought of James as an acquaintance? & a cigarette burning between his right-hand fingers, then watching his bow pattern in a mirror. that was in the general Bluegrass song bag. I did not even attempt to play newer & off the wall "contemporary"
songs like the ones of Don Reno or melodically handled tunes. No - I feel that Jimmy was a loner...by his own design. Jim Moss: The money hadn't changed that much by 1984. He paid a bass player I got for him $80 for a show. He got $8,000 for the show. Lamar Grier: I also heard the in the early 1960s, Bill had a booker that got him jobs in N.C. for $60 shows. booked Bill to stay over an extra day in Montreal for $65. That's less than Bill's cost of just paying the band. I don't know what the two day total was but Bill verbally jumped all over Pete for that action. Jim Moss: What did you do for IBM? I always say, "Just remember, the first three letters of IBMA are IBM!". Lamar Grier: Now, did you present that in a condescending way? but that was because my machine was delivered to me with that clip missing so I never missed it. I was hired. It was the kind of job that I can't tell you what it was unless I kill you afterward. a few classes I took at nearby University of Maryland in English, math, & software programming. hang in there like many others. Lamar Grier: I don't know. Did you know that Tex Logan (in that photo) had a Phd in math from MIT? answer, but let me tell you it wasn't square and it was larger than a 1 x 1 square. Significantly! Again, I could not have figured it out, even to the degree or precision that Tex did. Nor can I validate it. Jim Moss: Did you ever record with Monroe? Lamar Grier: Yes - with Pete, Richard, & you know who playing bass. Album titled Bluegrass Time. We recorded it in 3 sessions, in the Columbia studios on 18th Ave (music city row) in Gnashville. at the Opry, Bill came storming back into the dressing room glaring at me and asking, "Are you gonna quit next?" I hemmed & hawed & looked at the floor. look back on Bluegrass as to what gave notoriety, so they talk that venue up as wonnerful. What would have been their tone had anything else succeeded? Bill could not judge banjo players well, but Rudy was excellent. Jim Moss: I am partial to Baker's playing. He has been a great friend and mentor to me. To me, 1970's Kenny Baker was the killer sound. So, do you get asked for interviews regarding your work at IBM or the whatever agency much? Lamar Grier: Not at all. But that's all right. Jim Moss: I think when you look back, at the end, you will remember your time with Monroe, not the years at IBM. and moved from his long held home in Madison. Jim Moss: I think it is a place where you can put your name down in history. Lamar Grier: What's that old expression, "that & $0.10 could buy you a cup of something." Like...so what? as well. Who's makes these value judgements? Jim Moss: Welcome to cult music forms! Less is more and all that. 2) if it makes it to AM radio, it is not music. of a time when they trusted their parents, the government, the social norms. communism was to them. The Nashville Sound is like what Madonna is to Rock and Roll. who have a sound that they hear and want to put together, a sound that will out last all contemporary efforts. a thing or two about marketing niche products, such as non mainstream music. band banging that tune out, and there was this fiddler who just was as clean as you can imagine. but here I was a young kid 20 years later being blown away by this cool break. Success. Money is not success at this level, it is something more important. Like George Burns said in the movie Oh God, "If you want to make money, sell earth shoes". not as much as if you totally sold out and played stuff you couldn't stand to listen to. Lamar Grier: Mom & Dad's Waltz jumps to my mind too. Jim Moss: How did you start playing with Bill? that every weekend there would be a music party at one of about 1/2 dozen different people's home. Cambridge Mass. Bill Keith & Pete Rowan heard about them and come down to D.C. to one of them. then playing guitar with Bill and they had a left handed banjo player, Don Lineburger. that had a fairly large BMW logo on the front. I told Pete that, & he said, "No problem". He got one of his shirts from the bus & loaned it to me - so all systems were go. with two children, David and his younger sister who was about a 1/2 year old. afterward told Pete & Bill that yes, I would quit my day job & give the music a try. was due to me, and on time. the community where he lived, at a grocery store in Hermitage Hills (on the East side of Nashville). would come down to the store around 6:45 AM to wait for the store to open for business at 7.
enjoy their first beer of the day. I also went hunting with Jimmy Martin one day with about 4 of his beagle type hunting dogs. But anyhow, I digress. That's how I became one of the bluegrass Boys. Jim Moss: Regarding "Bluegrass Time", I was not sure that was you on those recordings. I knew it was Richard. Lamar Grier: I was on all of the Monroe recordings with Richard. that didn't make it. How many songs total did you record in those sessions? Lamar Grier: There were about 10 of the tunes we recorded on our only Decca/MCA album. Jim Moss: II don't remember how long you stayed with Monroe after Richard left? to Bluegrass, the more you realize that it is just Bill Monroe". I think that is ridiculous. Look at Del McCoury, for just one example. Some people are just so full of over blown rhetoric. Bill has defined the boundaries, there is a lot of room to fill out that area without simply copying Monroe. Osborne Bros, Stanley Bros, Reno & Smiley, etc. So it wasn't as exclusive as Pete portends it to be. in truck stops. "No rooms? ", I said. To which he said, "maybe this is not your kind of band". couple of times. Frank does not like me to book tours like that. the bands I had played in had no where near the standing of his and we had rooms. they had to play every Saturday night Opry. They always had to bolt back to Nashville on Saturdays. the next Saturday, they'd never had their boots or sox off since they left Nashville a week ago." How's them for sleeping arrangements? "Bill Monroe late because of Bluegrass Breakdown." I got a chuckle out of the injected humor into their financially poor situation. Jim Moss: What is the story with the death of Scotty Stoneman? I heard that he drank shaving lotion. Also, did you see Scotty on other occasions? of the small few people that I did not want to associate with. I did not respect his way of life. what they said about him as long as they mentioned his name in the process. People would remember that. Like I have heard, Scott was good, but he had a relatively small bag of fiddle tricks to offer. Scott & a brother went out there when their father was in there & turned the shed over. Whatta swell thing to do to your father. Jim Moss: So why did you stop playing Banjo? or did you? belong to a band anymore. I can see a small few reasons that I quit - some blame me and the rest blame others. in maintaining my proficiency began waning. initial "spark" to play bluegrass...early 1948. The music in the 1980s was far afield from where it was prior. mode-of-operation is to do pretty 3 part harmony Osborne Bros songs, I almost fall asleep. contrast & flexibility of the band. Tell me, who today does duets, beside the folksy types? It's all trios, quartets & more. that tune is one of the things that drove Kenny Baker away too. The drummer on the Opry, Harold, use to say that Monroe's band didn't need drums - their timing was solid. from the fiddle & its double stops etc. I feel this maneuver weakened the structure or the musical organization. electric guitar with a local band. That's okay, I could have sat down & talked with him during the breaks. Jim Moss: Did you ever have a chance to meet Kenny Baker while you were a Bluegrass Boy? Lamar Grier: As a post fact. We met musically on stage where there were a throng of Bluegrass boys called up on stage. there was no direct interaction with Kenny. Jim Moss: Did you ever go work on Monroe's farm? to give him some more bales to work with & I was developing energy loss in that exercise. I felt "whooped"
Jim Moss: Did Birch chase you around the Bean Blossom park with a hatchet? I think he did chase Bob Black... He chased one of the banjo players. have previously recorded together?" Charlie responded, "Boy! Do you want to start a fight?" one would want to duplicate. from Bill's reputation, talent, & skills. So the bottom line is that Bill was out 2 million dollars. What a typical Monroe business decision! Jim Moss: Can you remember anything about the Bean Blossom Barn shows? radically modified since I was there and I haven't been back there since to see the renovations.